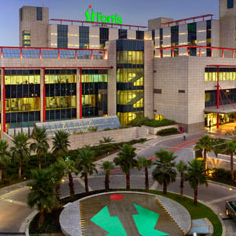 Fortis Memorial Research Institute (FMRI), Gurgaon, is a multi-super speciality, quaternary care hospital with an enviable international faculty, reputed clinicians, including super-sub-specialists and speciality nurses, supported by cutting-edge technology. A premium, referral hospital, it endeavours to be the Mecca of Healthcare for Asia Pacific and beyond. Set on a spacious 11-acre campus with 1000 beds, this Next Generation Hospital is built on the foundation of Trust and rests on the four strong pillars Talent, Technology, Infrastructure and Service.